For your contemplative seminar. 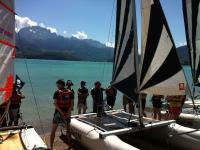 Enjoy a sailing boat ride on Annecy's lake. For your contemplative seminar. 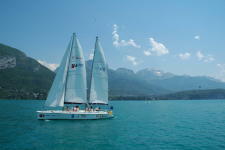 Magnificent walk framed by bicycle along Lake Annecy, followed by a walk on the lake in a group sailboat and a savoyard aperitif. This activity is ideal to spend a relaxing time on the lake ! 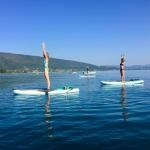 Enjoy calm water and wonderful frame of Annecy's lake to discover Yoga on a stand-up paddle. Guided by a professor, and well installed on your paddle, learn breathing techniques and Yoga positions. For your contemplative seminar. 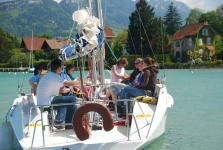 Enjoy Annecy's lake and the sailing boat ride with "aperitif" on board. And the mountain becomes accessible ... for this innovative seminar. 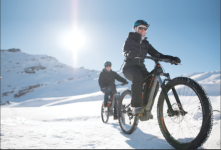 Thanks to the electric bike, practice mountain biking together, without suffering ! 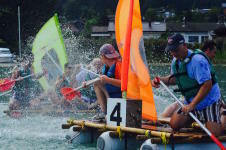 Discover this Team-Building challenge by team : pedal boats race, stand up paddle joust, kayak skill test, double paddle ride... Enjoy the wonderful frame of La Crique beach, and show team spirit and cohesion to win this playful challenge. Discover this original challenge of adventure to live by team ! 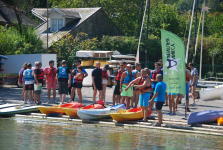 Enjoy La Crique beach surroundings to experience the following challenges : orientation challenge, mountain bike technical ride, raft building and race on the lake ! Compose your seminar among our multitude of activities for an exceptional day. 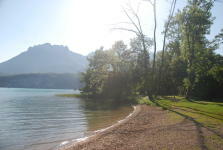 Nature themed seminar with a panoramic hike and wonderful viewpoints over Annecy's Lake or surroundings. After this hike, enjoy a traditional Savoyarde cuisine made by our quality restaurants partners. 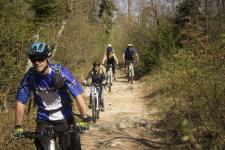 Form your tribe, choose your chief, and start 2H30 of crazy challenges ! Use all your competences to beat the other team during these unusual challenges. Good laugh guaranteed ! 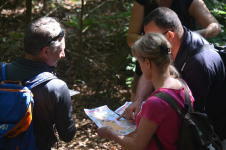 Supervised by an orienteering specialist, come and try to learn the basics on how to read an orienteering map during a true race. Challenging seminar in the heart of the forest with view on Lake Annecy. The Escape Room is a new concept meant to reinforce the team spirit . Thought, logic and communication are required in this game which goal is to solve brain twisters in record time to get out of a room. Wonderfull downhill of 1300 meters altitude difference through the Semnoz forest, with some views over the Annecy Lake and surrounding mountains. Have an unforgettable experience, full of sensations!! Guided by high mountain guides, discover an original Via Ferrata during your full of sensations seminar. 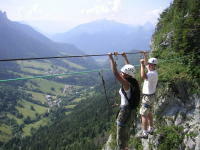 An exceptional site for a sensational course (in the mountains, above Lake Annecy): climbing, abseiling, zip line, monkey bridge. 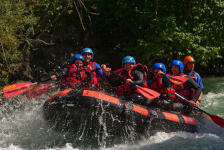 From the discovery of the stunning Gorges of Centron to the sensational descent of the "Intégrale" of the Isère river, we invite you to discover beautiful landscapes while doing rafting. Exceptional seminar for your team ! 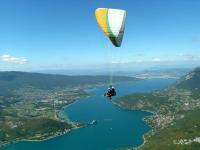 Discover one of the best view over the Annecy Lake from above with our amazing paragliding flights, comfortably seated. The Montmin canyon is one of the most beautiful in the region. 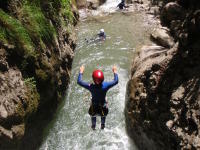 Choosing to practice canyoning for your seminar is to live intense sensations while having fun. Pure happiness! Looking for something original for your seminar? In an unique and authentic setting, close to the lake with view over mountains, share a cheerful and genuine time at La Crique beach, in middle of nature. Come to take a ride on the MD Libellule for your seminar. 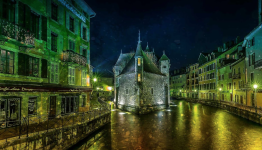 This is the only restaurant-boat on Annecy's lake where you will enjoy a timeless dinner on a boat. 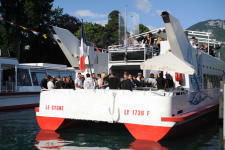 You will enjoy panoramic view on the lake, traditional dinner and dancing on the boat during your seminar. During this seminar, you will go for a great adventure in an exceptional place. 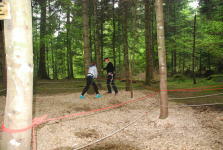 Good atmosphere guaranteed for this night-time Team building in the trees. At the end of your course, you will have the chance to taste local Savoyards products. This is nature pleasure ! 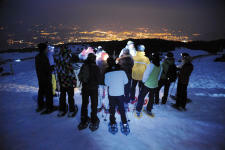 Enjoy a night in the mountains, for a simple and authentic moment far from the routine, on top of the Semnoz Mountain. 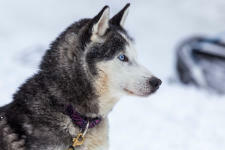 Come discover Northern Dogs universe on the Savoie Grand Revard plateau for a seminar full of emotions. 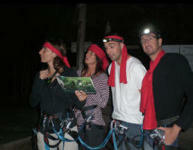 Discover mountains at dusk and share entertaining and simple moments with your team! After the effort, taste a delicious Savoyard meal in a mountain restaurant. A typical Savoyard seminar! 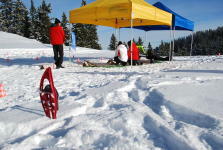 Leave for a snowshoeing hike on this nature themed seminar. During the hike, you will have the opportunity to taste a variety of the best local Savoyard products with our guide, specialist of the region. Team Buildng seminar : In wintertime, mountain can be a hostile place... Will your team be able to survive in a limited amount of time? Team Building Seminar: by teams, give the best of yourself to help your team to win on the different sporty and funny activities included! At the end, a final ranking is made and prizes are given to the best team!! 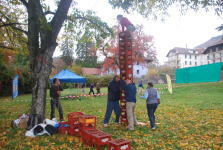 Team building seminar : try a funny, sporty and unifying challenge ! 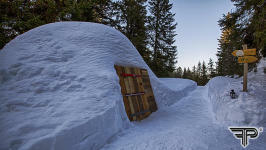 At dusk, after ski pistes closing, try an original and entertaining activity: Downhill sled ! Choose it for a funny seminar! 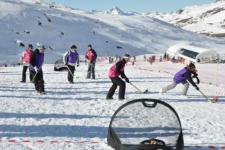 Team Building seminar : Bring your teams into opposition during small Hockey on snow matches. 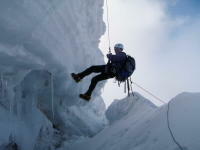 Let's try a icefall climbing initiation in wonderful landscapes. For an exciting seminary ! 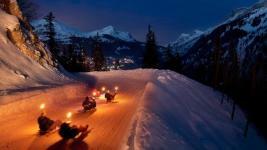 Come enjoy riding pleasure with a steering wheel toboggan, at dusk ! Great sensations guaranteed ! 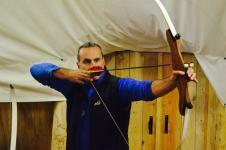 Try your dexterity on one of the following activities: archery, blowpipe or Polynesian arrows. The ideal activities to make an aperitif more entertaining! 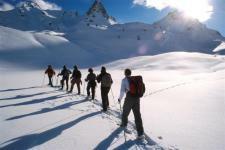 Discover the Ski Joëring discipline in autonomy and let yourself be pulled by our horses through snowy landscapes. 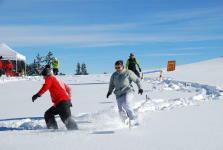 For your incentive seminar evening, come try the Alpine slopes close to Annecy with a local kind of sledge: the Paret, that will offer you new kind of sensations! Then, enjoy an excellent local Savoyard meal in an alpine restaurant. 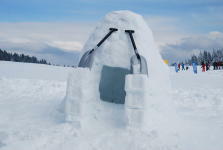 Enjoy an original night in an Igloo village, surrounded by mountains, to live a simple and authentic moment far from the routine.